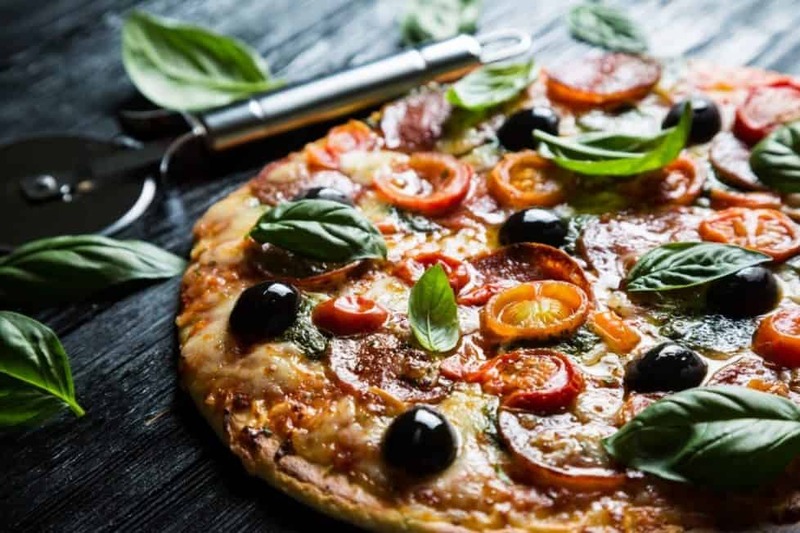 Maybe you’ve heard about them mentioned by your favorite Italian cuisine chefs on TV or through your foodie friends and cooking enthusiasts, but nowadays, pizza stones are the first thing cooking experts rely on when they want to accomplish restaurant-level pizzas. It is all in the way those bad boys take in heat, which results into sought-after golden brown hue and crispy texture. Hence, if you love both baking and eating pizzas, this stoneware deserves a place in your kitchen. What Does a Pizza Stone Do Exactly? Pizzas are not going to be erased off of the list of the world’s most popular foods. While some of us are happy with the taste of homemade pizzas, some do want to create their own while at the same time re-creating the taste of genuine firebrick oven pizzas. You can accomplish this using a pizza stone since it provides even heat distribution throughout without sacrificing the dough or the toppings; the entire pizza gets baked perfectly, minus burnt bottoms and partly-cooked toppings. The stone is a stoneware platter that is either round or rectangular and is positioned under the pizza over the course of baking. It has a porous surface so it can take in moisture from the dough while allocating heat all over the pizza. This results into a nicely-browned pizza without burned bottoms with a perfectly baked topping. The item can be created by differing thicknesses and a range of materials from terracotta to sand. While it is significantly capable of enduring extremely high levels of heat, it can break so you have to be extra cautious holding them. Pizza stones are also prone to thermal shock, thus it is advised that prior to washing/cleaning the item, the stone should be cooled down completely before running it under hot water. A cold pizza stone should not be placed inside the oven right away as well since it can crack in hotter locations. Preheat the stone first, place it on the middle shelf and heat to the required temperature, letting the stone heat along with the oven. Make use of a pizza paddle or peel to position the homemade pizza on the stone to bake. The stone accomplishes great results by distributing heat properly, since the stone itself warms up. While it heats, it distributes heat in a balanced manner across the pizza as compared with standard baking sheets. This guarantees that the dough will rise evenly, and it will be baked all the way through and the bottom of the crush will turn crunchy while the rest becomes soft and chewy. In case you want to bake a frozen pizza, do not position it on a hot stone. Situate the frozen pizza on a cold stone in an oven that is unheated and then allow the heat from the oven to reach appropriate temperature. To keep the pizza from sticking on the cooking surface, cooks must add cornmeal on the stone. Do not make use of cooking sprays or oils on the item – not unless it is suggested by the stone’s manufacturer. Once the pizza is baked, take the pizza away from the stone by using a paddle or peel. Let the stone linger in the oven to cool down along with it, or you can take the stone away from the appliance and position it on a cooling rack. Do not place a heated stone on a cold surface since this can damage the item. Cut the pizza by transferring it to a cutting board so it will not damage the surface of the stone. Keep in mind that majority of pizza stones get discolored with age and use. The stoneware should never be washed with soap or any kind of detergent since it can seep into the stone, which can affect the taste of the food. Clean the stone with a dry brush or damp cloth instead. Also, do not set the stone in the oven with the self-cleaning setting activated since several ovens heat way too fast, and this can cause damage to the stone. It does not matter what kind of pizza you want to create, whether it’s a good old classic Supreme style pizza, the four-cheese kind or a simple margarita recipe, but baking your homemade pizza with a pizza stone will provide it that restaurant-quality kick. Baking stones are capable of retaining heat, distributing it evenly, and it can even absorb moisture; thus the pizza is given flavors reminiscent of brick oven pizzas. If it’s your first time to use one, here are a few tips you have to remember. Prepare the stone by preheating it first; position a room temp stone in the oven before switching it on. Set the oven to the required temperature and let the two heat together. Remember to place the stone on the lowest shelf. A stone that is preheated prior to baking distributes heat evenly, which guarantees crispy pizza bottoms. You can prepare your pizza while waiting for the stone and oven to heat. The pizza peel or paddle is a device with a semblance to a shovel. It is mainly used to slip the pizza in and out of ovens. You can make the pizza directly on the peel, then slip it into the oven, but you have to make sure that the surface is non-stick. For a non-stick surface, try putting a generous amount of cornmeal on its surface first before situating the dough above it. Position the dough on the paddle or peel and then put the sauce, your choice cheese and toppings. Scatter a tiny quantity of cornmeal on the stone in the oven and tilt it so the pizza slips off onto the stone. In case you do not own a pizza peel, you can also make use of a flattened baking sheet or a stiff, big piece of cardboard to slide the pizza. Baking instructions will differ; it will be based on the kind of pizza you want to create. It is suggested that for better results, you should always keep track of the provided instructions in the recipe. Remember though that you have to make use of lower temperatures for skinnier pizzas with just a few toppings. Higher temperatures work best on pizzas with plenty of toppings and thick crusts. Make sure to leave some small space around the borders of the pizza. Putting cheese or toppings close to the border will result into a gooey mess that will reach the stone. This will make the pizza stick to the cooking surface as well. To take away the pizza from the oven, cooks have to carefully slip the pizza peel beneath the crust. After a few uses, the stone will be seasoned enough that the baked crust will not stick to the stone any longer. Make sure that the peel is placed all the way beneath the pizza and then take it away from the oven with caution while steadying all that weight. Keep in mind that the stone will stay hot throughout. Do not attempt to carry the stone as soon as you have removed the pizza. Furthermore, do not try to remove the stone or pizza with oven mitts or even kitchen towels since they are extremely hot and may result into major burns. Instead, take away the pizza with a peel or paddle, switch the oven off and let the stone cool down completely within the oven. Cooling down will take around an hour or longer. Only remove the stone when it has cooled down entirely. Pizza or baking stones are porous, meaning they can take in any moisture that comes into contact with them. This can alter the flavor of the baked food, thus the majority of manufacturers suggest that to clean the stone, users only have to use clean, warm water on the item. Soap and other kinds of detergent are generally avoided. Baking pizzas at home is one fun activity, but a pizza with intense flavors brought out by pizza stones will make eating them a rich, enjoyable experience. Selecting the best pizza stone begins by checking out the dimensions of your own oven, so make sure that the stone you purchase will fit properly inside. Choose a stone model that has dimensions close to the measurements of your oven as much as possible. This is important since this helps the item in catching and holding heat effectively. Make sure that you take into account your budget as well. There are affordable stones as well as expensive ones. The price will be based on the stone’s thickness, size and quality. Pizza stones are normally constructed from firebrick, a material that is able to endure intense heat, capture and hold heat efficiently. This material is also capable of distributing the heat evenly across the oven, which results into a perfectly baked pizza. Several stones are a bit lighter than standard ones while some are thin, thick and really heavy. It is often said that thicker stones provide better results and they also last longer too. They do not fall prey to cracking and breaking as long as they are taken care of well. Thicker models are also more effective in retaining heat. Stones come in circular or rectangular shaped forms. While both can do well in terms of creating pizzas, the rectangular shaped ones allow for a bigger baking surface. They also make placing the pizza on the stone and removing it simple and effortless. Round ones are more affordable though, so if you have a limited budget, you can go for the circle-shaped models. Other than taking in the factors mentioned above, you can also refer to pizza stone reviews online for more information and opinions. The reviews come from customers who have bought the item and they will tell what they like and did not like about their purchase. Reviews might also provide you hints if there is a recurring problem with a particular brand. So here are 5 of the most sought after pizza stone models available today. Crustina’s very own Rectangular Pizza Stone is for the versatile cook. Its rectangular shape allows for cooking of other baked goods like bread and scones. Other than the oven, the item can also be used over the grill. Because of its shape, it provides an even bigger cooking surface as compared with spherical models. Satisfied customers who have bought the item said that the baking stone was able to distribute heat evenly, get rid of leftover moisture and endure high levels of heat. Heritage’s 15-inch Black Ceramic Pizza Stone is a durable piece of work, guaranteed to last plenty of pizza-making experiences. This is a pro-level baking stone that is constructed to endure high heat levels and will not easily crack under pressure. Users can make not only pizza on this stoneware, but other foods as well (from bread to cookies). Its non-stick ceramic surface lets the food slide easily and will never stick to the surface. Rocksheat’ss 14-inch Round Cordierite Pizza Stone is tough; its 0.6-inch thickness offers a broader range of heat capacity, guaranteeing a balanced distribution of heat throughout the pizza. Now you won’t have to worry about mushy middles, burnt crusts or uneven color; this pizza stone will take care of your pizza and make it more palatable. Pizzacraft’s Rectangular Cordierite Pizza Stone is a versatile baking stone meant for creating not only pizzas, but other baked goods and pastries from bread and even frozen pizzas. Due to its square shape, the model is perfectly able to spread heat evenly across the stone for great pizzas with that needed tasty brown hue. It is simple to use and is thermal shock resistant so users can make pizzas with the stone for a longer time. The model is durable and will not easily give in to cracking and breakage at intense levels of heat. Now if you are after making great homemade pizzas minus the homemade taste, you can achieve that restaurant flavor by way of a pizza stone like one from trusted brand Old Stone Oven. The company’s Rectangular Pizza Stone can accommodate bigger pizzas without exceeding on the sides. Its rectangular shape also allows for more cooking surface. The item is made from lead-free clay so it can be used safely in the kitchen. It can withstand extreme levels of heat for up to 2000 degree F. Very durable and solid. If your love for pizzas has led you to make one in the comfort of your own home, then it is time that you maximize those pizza-making experiences with a pizza stone. Even that frozen pizza that you purchase on that corner grocery store will turn into a gourmet feast once it lands on the stone and is baked to perfection. The pizza stone is a great means to warm a frozen pizza, turning it into a nicely-browned dish that may not feel out of place in a pizzeria. Making pizza is not a tiring activity; in fact, it is pretty simple. Just make or buy dough, make the sauce or just buy pre-made ones, put the sauce on the pizza, then add cheese and toppings. Place the pizza on the stone and then bake it. Owning a pizza stone drastically reduces time spent on baking every pizza, thus it is recommended for folks who love inviting their friends over for a slice. Then again, just like any kitchen aid, it needs proper cleaning and maintenance too, in order to preserve its structure and provide more service. Strictly follow manufacturer’s instructions on maintenance and cleanup methods, and the stone will be fine. Owning a pizza stone will no doubt bring your homemade pizzas to a whole new level, so make sure that you made the right purchase by way of this article.